Lakshmi Narayana Story – Why Goddess Lakshmi’s Name Is Uttered First? 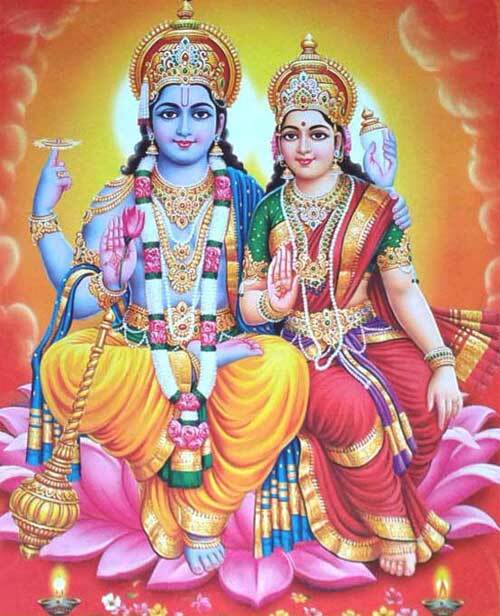 Lakshmi Narayana is one among the numerous names of Hindu God Vishnu. Goddess Lakshmi is the consort of Vishnu. The story of the divine couple is found in the Puranas and Epics. The name Lakshmi Narayana is of great significance. The reason why Lakshmi’s name is uttered first is that She is the Shakti of Vishnu. Vishnu sustains the world with the help of Goddess Lakshmi. Without Her He is not complete. Creation will not take place if Shakti is not present. Union is necessary for creation – not just of human beings but of all living beings including plants. What we call nature is the union of Vishnu and Lakshmi. Lakshmi Narayana was coined after the famous Samudra Manthan or churning of ocean episode. Goddess Lakshmi reappeared sitting on a thousand petal lotus and Vishnu made Her His consort. Vishnu then declared that Goddess Lakshmi’s name must be uttered first. Goddess Lakshmi resides on the chest of Vishnu and therefore he is known as Srinivasa. Shri is Goddess Lakshmi.